Hmm, so hey fellas, how's summer? I know it's pretty hot. Really hot. But well, doesn't keep us from writing, does it? Although I am not writing much new today. It's just that there is a certain "unsent letter" that I am sharing with you which is a sort of fiction piece I submitted to a website long back. The contest was basically to submit an "unsent letter" which is by definition a letter which you write to someone but then you don't send it due to many reasons. You may be too shy to send it or something like that. Basically, it becomes an Unsent Letter. I wrote this letter from a son to a dad. Mind you, its a pure work of fiction. No correlations whatsoever with reality, I love my father eternally. I have picked up my pen once again to say things that I have been trying to say since long. Things that I wanted to say all these years. Things that I avoided. I want to say those words that I could never utter before. Words that were left unsaid. Since my childhood I hated you. I was the only one in the block without a bicycle. 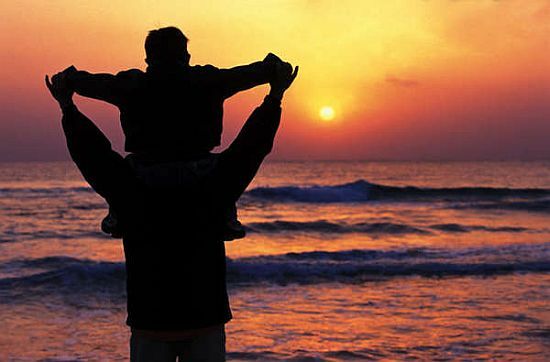 Every friend of mine had a loving father who cared enough to understand the needs of his boy. I hated myself for not having such a father. I remember those times when you used to break your promises every month. “Next month, I will get you a new one for sure,” you used to say. But that next month of yours never came. Only thing that came was disappointment, day by day. More false assurances and more dilly-dallying. I began to know your answer to my every wish even before I expressed it. I remember losing my friends when they did not allow me to join them in their bike games. They would ask me to get a bike of my own or get lost. I got lost. But I did not care when I lost them. I did, when I lost you. The gap between us widened. It was neither the first time nor the last. All that was left of you in my mind was your act of breaking a promise with a smile. A smile that gave me hope. A smile that asked me to be positive. “Good days will come”, mom often used to say. But they never came. All that came were painful memories of a son parting away from his father. From a father who couldn’t help it. Memories of a son who never understood what was wrong. I never knew why it was so hard for you. To get me a bicycle, to take me to the fun park, to get me new shoes…I never understood why. I could never decipher that smile of yours. A smile that was supposed to cheer me up eventually turned into a smile that I could not stand anymore. I moved on. I moved away. Away from you, away from life. “I will never refuse anything my son like you did, I will give him all the happiness on this earth”, I had said as I left your home to be on my own. I could not stand those evenings anymore, when you would stand there in front of me, empty handed. I could not stand when you would come to me, sit down and smile. Smiling to convey that you couldn’t do it. To tell maybe next time you will. How could you smile when my cheeks were wet? How could you? But now, sands of time have shown me what I could not see before. I wish I had known the answers to my questions a little earlier. Earlier so that I could save you. Save you from the self-hatred you felt for not being a good father. To save you from those tears that you always tried to stop with your smile. I wish I could also see those moist eyes behind that smile. I wish I could understand you then. I wish I could save us. I wish. Because now I know the meaning of your smile. Now I know its importance. Now I know exactly how it feels to be incapable of something. Now I often feel that same helplessness you felt twenty years back. Today I may have all the money in the world to buy anything I want. I just don’t have things that money can’t buy. Things like love. Like you. Today Peter came to my when I returned home late from office. I wondered what kept him awake so long. He ran up to me, sat on my lap and said, “Dad, when will we go see grandpa? You had promised me this month, remember?” In his innocent face I saw mine. Tears welled up in my eyes. I tried to look away but I couldn’t. I had to smile. I love you dad. Please forgive me. Please come back. Touching.. All I can say is that it brought tears into my eyes..